I wanted to celebrate Valentine's Day today by sharing one of my favorite collections from one of this year's Ready-to-Wear Fall fashion designers. 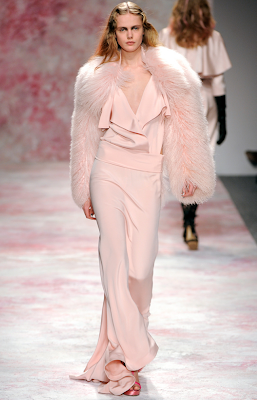 Prabal Gurung's line that debuted this weekend is full of luxe, romantic textures and colors--feminine but with an edge. (Those ribbon tights are pretty killer if you ask me). I don't normally gravitate to reds and esp not reds and pink together. BUT like everything in design, if it's done well (and in this case REALLY well), it will change your outlook. So fittingly, I find myself liking this palette and hope you do too! All photos taken from style.com. Check them out for more designers from this season's RTW Fall shows.